The Bishops volunteer on TheHopeLine to coach people who struggle with life issues. They have bicycled thousands of miles throughout America since their wedding. Thanks to these and other life experiences, their books overflow with wisdom, hope, and joy. Tim is a three-time Maine chess champion, a CPA, and a consultant for small businesses. He has also written a business book, Hedging Commodity Price Risk. He is still out to prove that the writing contest he won as a college freshman was not a fluke. Debbie Bishop is an overcomer with boundless energy and an adventuresome spirit. Transparent, relatable, and fun best describe her writing. She holds a Masters degree in literacy from Lesley University and has taught for nearly thirty years. Out of gratitude for what God has done in her life, Debbie studies the Bible enthusiastically. Her recovery from past problems and her relentless pursuit to improve fuel a desire to help others. Originally from New England, the Bishops live in Middle Tennessee. In their most recent book, Wheels of Wisdom – Life Lessons for the Restless Spirit, Tim and Debbie Bishop give some pretty amazing stories of where they have traveled across America. This book inspires the reader to understand they aren’t alone in facing the difficulties of life. The authors enable the reader to quickly get engaged along the journey and to relate to both the negative as well as the positive issues they encounter. We see how these challenges help to shape the characters of Tim and Debbie and how they become stronger and wiser through the traveled miles. There are scriptural passages throughout the book that point the reader to more than the authors' story, and show how one can deepen their own personal faith as they allow God to speak to them. There are also personal reflection questions at the end of each chapter which allow the reader to do a deeper self-evaluation. Tim and Debbie Bishop take readers along on their miles and miles of beautiful scenery, gorgeous weather, exhilarating people, and the adventures that help to develop and shape both their journey as well as their life. This is a fun book as well as one that the reader can eagerly grow from as they read and make the journey alongside the Bishops. Their ending wrap-up, entitled “The Ultimate Destination,” was a fantastic way to both honor God as well as to bring to a close such a wonderful, exciting adventure traveling through various states and making numerous memories. 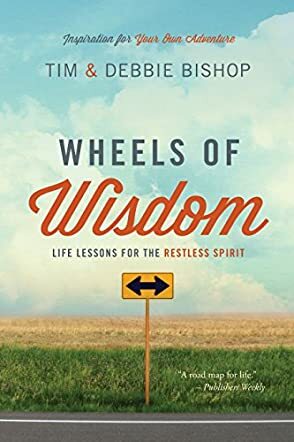 Wheels of Wisdom: Life Lessons for the Restless Spirit by Tim and Debbie Bishop is an inspirational book that captures the journey of two incredible people in fifty-two chapters as they journey across the country on bicycle, a book that is rich with insight and lessons for life. First off, this book takes the concept of the road as a symbol of the journey we make through life. The authors share their physical cycling journey, but it comes with invaluable tips, insights, and reflections that can shift the way most of us look at life. In the introduction they warn that: “We come at life from a Christian perspective. That’s just who we are, and we can’t very well be who we aren’t.” In this book, the reader will drink in the wisdom they learned “on the seat of the bicycle,” making a total of 10,000 miles and how those miles affected them spiritually. This is a book that will help readers shift their perspective, confront their fears and inner demons, face life with more courage and openness, and learn to enjoy the surprises that occasionally come their way. You’ll enjoy the connection between the coauthors as they share their thoughts, experiences, and insights. You’ll also enjoy the ease with which they connect with God. Here is a book that Christians will adore, a book about the “spirituality of the road,” and aren’t we all wayfarers? I loved the writing and the jovial, conversational, and popular tone of the narrative. I also enjoyed the fact that the ideas of each coauthor stood out distinctly. This creates an interesting and interactive experience with the reader. Wheels of Wisdom: Life Lessons for the Restless Spirit isn’t a book to be read in one sitting. In fact, it can be read over a whole year. Tim and Debbie Bishop make a beautiful offering that will enrich the lives of many. It is encouraging, inspiring, and uplifting. I will be journeying with this book for a pretty long time.